December is one of the most important months for SMEs, as Christmas and New Year can provide many opportunities to make more sales and ultimately more profits. The amount spent by consumers over the Christmas and New Year sales periods has been rising steadily year on year with a massive £78.7 billion being spent in 2017 in the UK alone. This number is also expected to rise again in 2018, which further stresses how important and potentially lucrative this time of the year can be. We’ve previously created posts like this which explain the basics around how to get your SME ready for the Christmas and New Year sales, but one of the key aspects for ensuring a successful sales period is having effective Christmas deliveries and returns to service them. Here we consider why this is the case, before detailing how you can make the most of our seasonal services to help your SME avoid any issues this year. 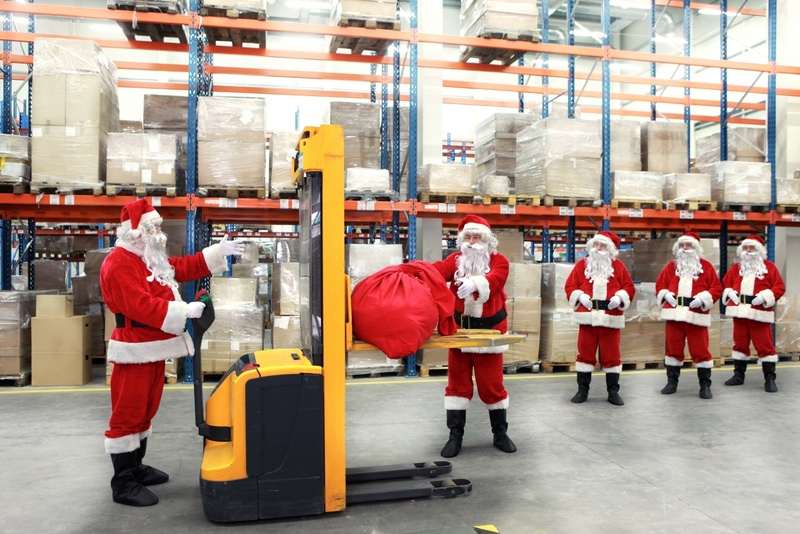 Why are your Christmas Deliveries and Returns so Important? Your customers or the companies you supply will want to receive their goods at the time you promise. Offering a variety of Christmas delivery options can make your SME appear more favourable to consumers and lead to more sales. Not all businesses will have a returns policy in place and by having this available it can again help make your company stand out. There will be an expectation from customers that your business will be fully equipped and ready to deal with the increased demand of a busy sales period. To help make sure you avoid these issues, you can use our delivery services to manage your Christmas delivery and returns requirements. We have a wealth of options including National and International delivery, as well as specialist Business Parcel services. We can also support any ecommerce aspects of your SME with our integrated solutions. These will link to your business’ account and can allow you to upload multiple online delivery orders at once – saving you a great deal of time and effort while at the same time accommodating the popular online consumer markets. Another key part of managing your seasonal logistics is managing expectations of consumers. In other words, making it clear to your clients and customers when your last Christmas delivery dates are and what services you’ll be running across the festive season. This is something your clients will appreciate and can also create a sense of urgency – encouraging them to place orders. 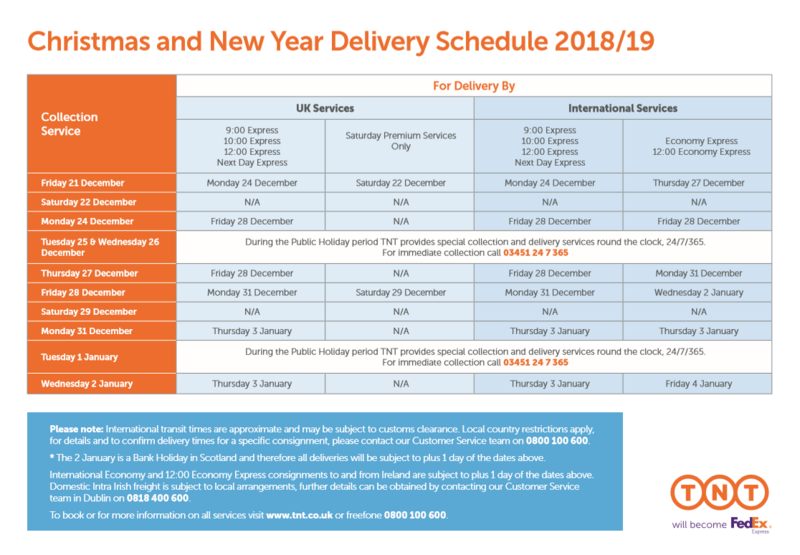 If you choose to use our delivery services, then also use the following table which clearly shows when our last Christmas delivery dates are, as well as our full shipping schedule through to January 2019. This is also useful for any returns as your clients can clearly see when any returned goods can be shipped or when replacements can be sent out. Whatever course of action you choose, the main thing to remember is to make sure you have reliable logistics solutions in place that won’t let you or your clients down during this busy, but important time of the year. If you need any more information about our Christmas services, then don’t hesitate to get in touch through our Help Centre. There’s also a downloadable version of our delivery schedule available here. This entry was posted in Business Christmas Small Business SME and tagged Bookmark the permalink.